As our country’s politicians engage in bitter partisan battles, focused on protecting their own jobs but not on doing the nation’s business, and political pundits shout louder and shriller to improve their ratings, it’s no wonder that Americans have little faith in their government. But is America as divided as the politicians and talking heads would have us believe? Do half of Americans stand on the right and the other half on the left with a no-man’s-land between them? Hardly. Forty percent of all American voters are Independents who occupy the ample political and ideological space in the center. These Americans are anything but divided, and they’re being ignored. These Independents make up the largest voting bloc in the nation and have determined the outcome of every election since World War II. Every year their numbers grow, as does the unconscionable disconnect between them and the officials who are supposed to represent them. The Swing Vote: The Untapped Power of Independents tells the story of how our polarized political system is not only misrepresenting America but failing it. 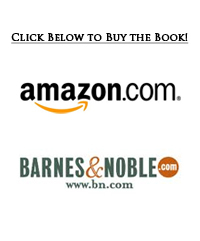 Killian paints a vivid portrait of the swing voters around the country and presents a new model that reveals who they are and what they want from their government and elected officials. NPR REPUBLICANS - Socially moderate and fiscally conservative, these voters, who have been known as ‘Rockefeller Republicans’, are frustrated by overspending and mismanagement of government. But they are also turned off by the GOP’s alignment with the religious right and its focus on social issues like abortion and gay rights. AMERICA FIRST DEMOCRATS – Previously known as ‘Reagan Democrats,’ these voters, largely male working class, have been hit hard by the recession and by Republican taxation and trade policies. But they also think Democrats don’t stand up for traditional American values both at home and abroad. They tend to be more conservative than the Democratic Party on social issues. THE FACEBOOK GENERATION – Voters under the age of thirty-five, who register as Independents in a higher percentage than any other age group. They mistrust politicians of both parties and want more than two choices. STARBUCKS MOMS AND DADS - The largest and most important Independent/Swing voting bloc, these suburban and exurban voters are skeptical of big government and turned off by extremism in both parties. A huge and vitally important group. They decide elections. 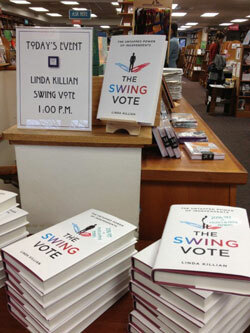 In “The Swing Vote,” Killian looks beyond the polls and the headlines and talks with the frustrated citizens around the country who are raising the alarm about the acute bi-polarity, special interest-influence, and gridlock in Congress, asking why Obama’s postpartisan presidency is anything but, and demanding realism, honest negotiation, and a sense of responsibility from their elected officials. 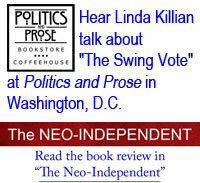 "Linda Killian has been an acute observer of national politics for over two decades, first winning renown for her path-breaking book on the GOP freshman class of '94. She now brings similar insight and shoe-leather reporting to one of the least understood groups in America - swing voters - who will likely hold the key to 2012 and beyond." -- David Gergen, Senior Political Analyst for CNN and New York Times Bestselling Author of "Eyewitness to Power"
-- Charlie Cook, editor and publisher of The Cook Political Report and political analyst for NBC News. "[Linda's] book - which makes the case that you and I have much more power than we know - is an important and timely read." 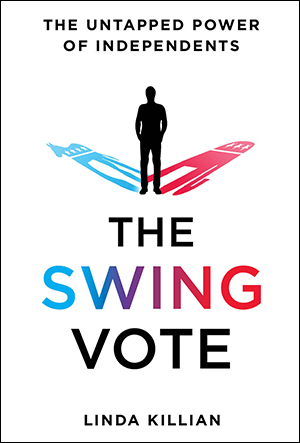 CNN's John Avlon calls "The Swing Vote: The Untapped Power of Independents" one of "the best political policy books of this presidential season." "The growing ranks of nonpartisan-political-reform literature (including The Swing Vote) will only become more valuable when this election is over and we begin focusing on an even more urgent mission: how to heal hyperpartisanship and begin governing again in the national interest." -- Scott Helman, "How will independents factor into the Brown-Warren Senate race?, The Boston Globe, September 30, 2012. The Swing Voter has useful observations. Killian, a former NPR reporter who is now a senior scholar at the Woodrow Wilson Center in Washington, emulated the admirable part of Broder’s legacy and traveled around the country interviewing hundreds of voters who are disaffected. There are lessons to be learned from her reporting. She identifies four types of independent voters. (1) "NPR Republicans" are "fiscal conservatives who are moderate or libertarian on social issues." They have been moving away from the GOP because of the religious right. (2) The "Facebook Generation" is mostly thirty-five or under; its members are generally social liberals (on the environment or race), but "this age group doesn’t really trust either political party and doesn’t understand why it can’t have more political choices." (3) The "Starbucks Moms and Dads" are "a fickle group who don't mind changing party allegiance" from election to election and "tend to be fiscally conservative and socially moderate, concerned about education, national security, and environmental issues." Finally (4), the "America First Democrats," concentrated in the Rust Belt, support strong defense, are populist on economic issues such as trade and protectionism, but are "more traditional and conservative on social issues than they perceive the Democratic Party to be." "I'm part of this huge group of Americans who feel disenfranchised. We don't like where we're headed. It's like we're riding on a bus, and the two parties are the drivers who are arguing over who gets to control the steering wheel. Meanwhile, there's a cliff in front of us and we're headed straight for it. The rest of us are stuck in the back of the bus, saying, "There's a cliff up there, do something." There is no question that millions of Americans share Pfaff's frustration. The "cliff" suggests bad, or very bad, economic prospects. But there is a question whether these millions can in fact become an organized political unit, and indeed whether—given their own very clear differences with one another, which Killian herself describes well—they even want to be. Click here to read the full review. Excerpt: Will independents really decide the election? "Campaigns are aware of this and know they have to win these voters but are also a little bit awkward with them," said Linda Killian, author of "The Swing Vote, the Untapped Power of Independents". She says independent voters like bipartisanship and don't like negative ads. It's the reason candidates often soften their partisan message as the election gets closer. For instance, Romney has tailored many of his views since the Republican primary to project a moderate image of a candidate interested in bipartisanship. Killian also pointed to independents' voting patterns. She says they don't think twice about voting for a Republican and Democrat in the same election. She points to a state like Virginia where Romney could win but so could Democratic Senate candidate Tim Kaine. In November 1994 the Republicans won control of both Houses of Congress for the first time in 40 years in a victory they immediately dubbed the Republican Revolution. 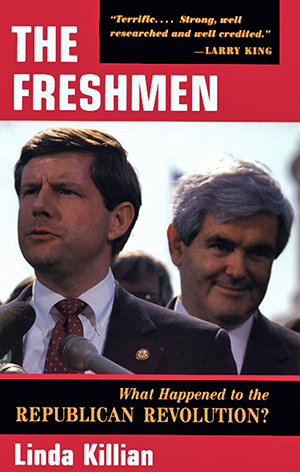 Swept into office in that election were 73 Republican freshmen, the storm troopers in Newt Gingrich’s army. The Freshmen is the inside story of those men and women and of the tumultuous 104th Congress, one of the most historic and eventful congresses in recent history. The freshmen were at the heart of the Republican revolution. Journalist Linda Killian presents a revealing portrait of their maneuvering and intrigues, their successes and failures. Were they committed idealists or wild-eyed zealots?Killian reveals how Congress really works through amazingly candid conversations with the freshmen. She offers a probing and intimate character study of the colorful and always unpredictable freshmen who shared their private thoughts with her. In early 1995 the Republicans were riding high but they were sent crashing by the government shutdown. Killian explains how they rebounded from that disastrous political maneuver to maintain control of Congress despite Bill Clinton’s re-election to the presidency, and also explains how the Republican revolution never really existed. Despite being labeled Gingrich clones when they arrived in Washington, in 1997 the freshmen attempted to overthrow Newt Gingrich as speaker of the House. Killian tells the real story of that failed coup. This book is the first detailed, behind the scenes account of the entire 104th Congress and is based on two years of extensive reporting and hundreds of interviews. Killian goes beyond the headlines to show us the power struggles through the eyes of the freshmen. She takes us to the House floor, the committee rooms and private offices of Congress and follows the freshmen back to their districts in small town America in places like Crossville, Tennessee; Wamego, Kansas and Janesville, Wisconsin. We meet class everyman Van Hilleary of Tennessee; firebrand and troublemaker Mark Neumann; former entertainer Sonny Bono; Enid Greene Waldholtz who is forced to leave Congress in disgrace and Sam Brownback who uses his freshman notoriety to win Bob Dole’s seat in the U.S. Senate. The Freshmen is a fascinating look at who the freshmen are and why they are different from other politicians. What did they actually accomplish and how did they change American politics? Much more than just the story of the Republican freshmen, this is the story of power and democracy, a vivid portrait of our times and of the issues facing our nation as we head into the 21st century. Praise for The Freshmen: What Happened to the Republican Revolution?